Home Unlabelled NEVER DRY LAUNDRY INDOORS, THE SIDE EFFECT CAN BE DEADLY! Drying clothes indoors poses a health risk, especially to those with weakened immune system or asthma. 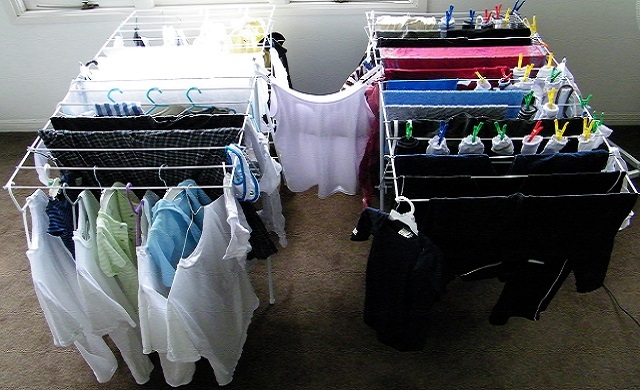 Recently, a man from Bolton got a lung infection by drying his clothes inside his house. The spores which appear due to the mold from the wet clothes can cause serious lung infections. Craig Mather (34) is a father of three children and he was diagnosed with pulmonary aspergillosis. He was prescribed antimicrobial medications and soon he felt better. However, the doctor told him that he must stop drying the clothes indoors, otherwise, his health condition will become worse. Following the doctor`s advice, Craig stopped drying the clothes inside for 12 months, and his health was significantly improved. According to experts, drying washing indoors can seriously harm your health. The evaporation increases the humidity by 30%, crating and ideal environment for spore germination. For instance, in a bunch of washed laundry there are more than two liters of water which evaporates in your room. Normally, people`s bodies are immune to these potential infection, but those with weaker immune system or asthma can experience breathing problems and coughing. Moreover, people with AIDS, patients who undergo chemotherapy, or those with autoimmune disease are at risk of pulmonary aspergillosis, caused by fungi. This disease can seriously harm your health, and in certain cases, it may even lead to fatal lung damage. Therefore, experts recommend drying the laundry exclusively outdoors.